Porous asphalt is typically recommended for parking areas and low-volume roadways. Additional applications for porous asphalt include pedestrian walkways, sidewalks, driveways, bike lanes, and shoulders. Also, porous asphalt has been used successfully for residential and urban streets, as well as highways. 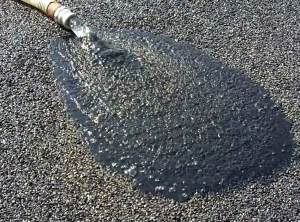 Porous asphalt can be poured as whole or in part with traditional impervious asphalt. When poured with impervious pavements or adjacent to building roofs, porous asphalt can sufficiently contain and treat the additional runoff generated. Porous pavement is a green alternative. As mentioned before, its porous nature allows rain to penetrate the surface and flow beneath the ground naturally, and more importantly, can be instrumental in preventing dangerous flooding. The reduction of storm system basins isn’t the only reason this type of paving is green. Porous pavement actually requires less energy to manufacture, which means less emissions, odor and smoke. It’s attractive and environmentally friendly – both during its manufacturing process and installation. Porous asphalt pavement can last up to twenty years before showing cracks or potholes. It is a very durable product and it retains the ability to handle rainwater for many years. Porous asphalt has been used successfully in parking lots, walkways and playgrounds, as well as high-volume highways that carry heavy trucks. Porous asphalt tends to be a little coarser than your standard asphalt but is still smooth enough to meet the Americans with Disabilities Act (ADA) requirements and it is still an attractive option to consider during the development process. Along with the environmental benefits that porous asphalt brings, there are also cost benefits associated with this paving process. Some local governments charge developers storm-water impact fees when water run-off from parking lots overwhelms the storm sewer system. Because porous asphalt helps reduce demands on the storm sewers, these impact fees can be eliminated. Another cost savings comes from eliminating the need to put in a storm-water management solution such as a retention pond. The land that is normally slated for the retention pond can be developed and used as a profitable asset that adds value to the property. Watch this video on Porous Asphalt below, to get a better idea of how porous asphalt can help your business, city or property.